Fighter jets intercept a plane from Pakistan that was allegedly threatened by two British passengers. LONDON – Britain scrambled fighter jets Friday to intercept a commercial airliner carrying more than 300 people from Pakistan, diverting it to an isolated runway at an airport on the outskirts of London and arresting two British passengers who allegedly threatened to destroy the plane. The security official requested anonymity because he was not authorized to discuss the investigation. 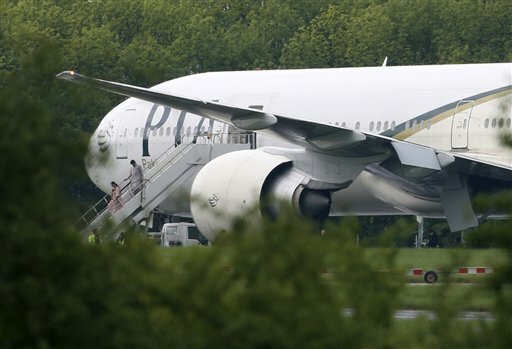 A Pakistani official briefed by British police and PIA security on the investigation said the two suspects, speaking Urdu, allegedly threatened to “destroy the plane” after an argument with crew. The official spoke on condition of anonymity because he was not authorized to speak about the case on the record. Flight P709 was traveling from Lahore, Pakistan, to Manchester Airport when it was diverted by the fighter jets to Stansted Airport. The U.K. Ministry of Defense confirmed that Typhoon jets were launched to investigate an incident involving a civilian aircraft but gave no further details. Passenger Nauman Rizvi told Pakistan’s GEO TV that two men who had tried to move toward the cockpit during the flight were handcuffed and arrested once the plane landed. Rizvi said that after the men were taken away, the flight crew told passengers there had been a terrorist threat and that the pilot had raised an alarm. Essex Police said they were notified at 1:20 p.m. local time (8:20 a.m. EDT) that a threat had been made to an aircraft. The force said that after the Boeing 777 landed at 2:15 p.m., armed officers entered it and arrested two British nationals, aged 30 and 41, on suspicion of endangering the aircraft. The suspects were taken to a police station where they face questioning, the police said in a statement. The plane will be examined by forensic specialists but no suspicious items have been recovered so far, police added. “This incident is being treated as a criminal offense,” the police statement said, in another indication it was not being seen as a terror case. Mashood Tajwar, a spokesman for PIA, said 297 passengers and 11 crew members were on the plane. By late afternoon Friday, passengers had disembarked from the plane and were being interviewed, according to Mark Davison, a spokesman for Stansted Airport. Police across Britain have stepped up patrols in recent days following the suspected terror attack in south London. Two men with a meat cleaver and knives attacked and killed a British soldier in broad daylight, and gruesome footage that emerged after the attack showed one of the alleged assailants angrily complaining about the British government and troops in foreign lands.